Home SharperIron Forums Principles & Consequences Church & Biblical History "Only God is Great"
The Protestant Reformation of the sixteenth century triggered a fresh wave of bloody conflict in Medieval Europe—a tract of real estate across which evolving nations had suffered tumultuous relations for many dark centuries. Protestant regions broke up Rome’s monopoly on authority in Europe. Neutralizing an authority is one thing; replacing it is quite another matter, and Europe tumbled into near-anarchy. Nation warred against nation and region against region in an all-out scramble to gain control of the rudder of Europe’s destiny. Historians generally recognize Louis XIV of France (1638-1715) as the quintessential absolutist monarch. Crowned at age five (a monarchial absolutist pre-schooler—you fill in the blanks! 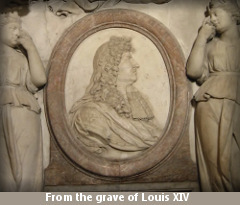 ), Louis reigned in earnest from 1660 until his death. That translates into fifty-five years of absolute sovereignty over every aspect of French life. Every citizen, of what was at that time the most powerful nation on the continent, was expected to conform to Louis’ every belief, obey his every demand, and honor his every decision. Imagine! Louis occupied the renowned Palace of Versailles just outside Paris—the most elaborate construction project of the century. To this day both palace and grounds gleam with exquisite splendor. Several thousand nobles lived at Versailles in Louis’ day and were attended by 4,000 servants. Louis was dressed with ceremonial attention each morning by men of noble birth. He and his fellow noblemen at Versailles lived alongside one another in splendorous luxury. They passed their days attending lavish banquets, receptions, concerts, plays, and balls. They spent inordinate amounts of time gambling and hunting. Any time that remained seemed to be filled with gossip, flattery, and lecherous living. Louis was widely known as the Sun King in reference to his royal emblem, for which the center of the solar system was deemed a fitting symbol. Louis was also known by his many admirers on the continent as the Grand Monarch. To remove any doubt as to where he stood on the theory of monarchial absolutism, Louis liked to remind people: “I am the state.” Few cared to argue the point, even fewer dared. Louis’ preferred title was “Louis the Great.” Indeed, achieving greatness was Louis’ chief vocation. A more magnificent reign can hardly be imagined. When Louis the Great died in 1715, Massillon was appointed to deliver the funeral oration. Revered for his funeral oratories, Massillon’s task on this occasion seemed straightforward, albeit daunting: Eulogize a monarch widely considered to be the greatest man on earth. Louis’ coffin bore silent witness to the temporal nature of earthly greatness. Massillon’s opening declaration bore vibrant witness to the unfading truth that there is only one eternal and absolute monarch. Providence provided Massillon the ideal occasion to trumpet the message that God rules eternally from heaven’s throne with sovereign authority over all kings and kingdoms (cf. 2 Chronicles 20:6; Isaiah 37:20; Jeremiah 10:6-7; Daniel 3:34-35). In the gloomy nave of Notre Dame, Louis XIV’s corpse confirmed that “All flesh is grass, and all its glory is like the flower of the field…the grass withers, and the flower fades away, but the word of the Lord abides forever” (Isaiah 40:6, 8). That abiding word counsels us: “Let not the wise man boast in his wisdom, let not the mighty man boast in his might, let not the rich man boast in his riches, but let him who boasts boast in this, that he understands and knows me” (Jeremiah 9:23). May our only boast be in God, who alone is great and greatly to be praised. Outstanding my man. Only God is great! May that be tattooed to our mind by way of conviction!